Cambridge, Mass. 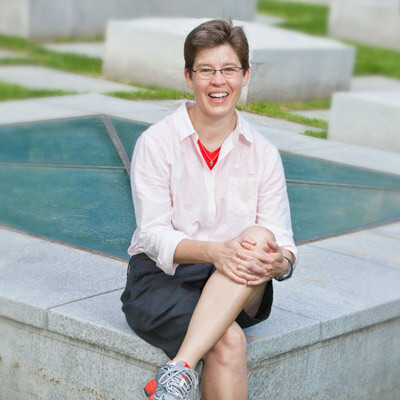 – November 17, 2014 – Harvard materials scientist Jennifer A. Lewis, whose pioneering work in the field of microscale 3D printing is advancing the development of artificial organs, flexible electronics, and special new materials, has been named among Foreign Policy magazine's "100 Leading Global Thinkers of 2014." Lewis, the Hansjorg Wyss Professor of Biologically Inspired Engineering at the Harvard School of Engineering and Applied Sciences (SEAS) and a Core Faculty member at the Wyss Institute for Biologically Inspired Engineering at Harvard, was honored among innovators "for showing how ink could reshape the future." "With her team at Harvard University's School of Engineering and Applied Sciences, Lewis has printed materials that mimic the lightweight strength of balsa wood for potential use in wind turbines and batteries that could streamline the assembly of small electronics," the Foreign Policy editors wrote. "In February, her team reported that it had printed cellular tissue constructs with embedded blood vessels—a step toward the manufacture of artificial organs." "Lewis's work shows that 3D printing won't just change how people make things," they wrote. "It will also change what, exactly, people can make." To bring such promising achievements to fruition, research in the Lewis lab entails innovation in both materials and manufacturing techniques. Lewis and her team have developed new classes of concentrated colloidal, fugitive organic, polymer, hydrogel, and sol-gel inks for pen-on-paper, inkjet, roll-to-roll and 3D printing. To expedite the transformation of 3D printing from a prototyping to a manufacturing platform, her team has also recently demonstrated high-throughput printing of multiple materials via multinozzle arrays. As a professor at SEAS, Lewis teaches an innovative course on biomaterials that introduces undergraduates to the biomedical tools of the future. Students benefit from access to cutting-edge laboratory facilities and world-leading expertise. She additionally co-teaches "Introduction to Soft Matter"—also known as "squishy physics"—with Shmuel Rubinstein, Assistant Professor of Applied Physics. Lewis earned an Sc.D. in Ceramic Science from the Massachusetts Institute of Technology. She has received numerous distinctions, including the NSF Presidential Faculty Fellow Award, the Brunauer Award from the American Ceramic Society, the Langmuir Lecture Award from the American Chemical Society, and the Materials Research Society Medal. She is a Fellow of the American Ceramic Society, the American Physical Society, the Materials Research Society, and the American Academy of Arts and Sciences. She serves on the editorial advisory boards of the journals Advanced Functional Materials and Soft Matter. She has authored more than 130 papers and holds nine patents. The 100 Global Thinkers were honored at a Nov. 17 ceremony in Washington, D.C., following a daylong policy conference called "Transformational Trends: A Year of Disruptive Thinking" with keynote remarks by U.S. Secretary of State John Kerry. Lewis participated in a panel discussion that focuses on global developments in the year to come. This is the second time a SEAS faculty member has been named to the Foreign Policy Global Thinkers list. Jonathan Zittrain, George Bemis Professor of Law at Harvard Law School and Harvard Kennedy School and professor of computer science at SEAS, was honored in 2012 for asking "more than anyone... who the Internet's public and private gatekeepers are, how they're acting, and what that means for the future of the open web."